The Castanetters are all of pure mind. See, hear and speak no evil. Commendable folk. Now, let's have a look at that misbehaving spastic digit, shall we? Catsumi wrote: he Castanetters are all of pure mind. See, hear and speak no evil. Commendable folk. My clicker has been under control all of my life. I'm sure I don't have any little 'likelets' running around that I don't know about. I can feel them snickering away at my lack of control. I just don't know what happened...I mean my clicker was strait and ready for a long night of waiting to do it if I were to do it at all and then...it just happened. The Little Lost Likelets, a good title for kiddies book. You seem to be developing a fever, OT. On the threads it has been noted that you haven't expressed a violent solution for our social ills some time now. No mention of chopping off crooks' hands or nuclear war for one and all. Are you undergoing a metamorphoses of sorts, like Camus' The Fly? Dearie me, could the heat be getting to you OT? Catsumi wrote: ou seem to be developing a fever, OT. On the threads it has been noted that you haven't expressed a violent solution for our social ills some time now. No mention of chopping off crooks' hands or nuclear war for one and all. Oh...you have seen nothing yet. Nothing. Ever heard of Darth Vader?.... total amateur. edit- Wait a minute...when have I suggested violence? This Candy Striper in me suggests that your hand chopping and nuclear war scenarios might underly a psyche prone to the wild side of human (mis)culture, most definitely on the violent side. What can I do to assist you in overcoming that side of your nature, OT? Perhaps restudy The Way of the Skunk? (Page 2. 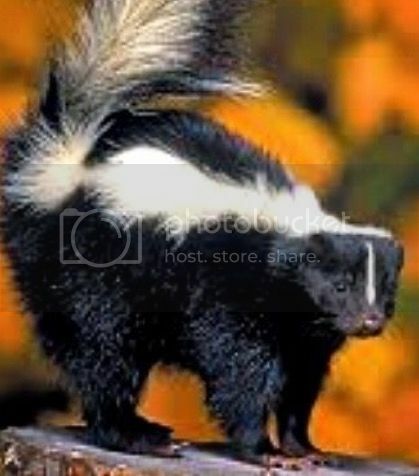 "A skunk personifies the way of nonviolence.....etc). C-nuts are a peaceable lot so concern for a Darth Vader in their midst is cause for consternation, worry. Well... cutting off the hands of thieves kinda went out when we quit drinking from the skulls of our slain enemies. I'm sure it worked as a great deterrent against theft. Vader actually turned out to be a good guy in the end... and it was his undoing. " Master, he will join us ,or die". All he had to do was stick with the plan, but he blew it. Here and there, including Castanet, I am noticing more mention of hand chopping as a deterrent/punishment for thievery and drug pushing. Idea is Gaining traction daily, OT. Soon, maybe here in West will have the same high moral standards as eastern potentates. My question is, what becomes of those detached paws? Does the owner wear it on a gold chain around his neck so that when he dies, his missing member and himself will be forever reunited? Like eunuchs with their jewels, or like headless ghosts with noggins? Or should they be laid out on a blanket in the market place as warning and possible soup starter? Is the chopper a government employee with pension or can anyone mete out justice vigilante style after being ripped off? Much to think on, OT.
" Nothing comes close to piloting some machine wearing womens slinky, soft and sensual lingerie. Nothing. " Gosh OT, you live such an exciting behind-the-scenes life, or are you just "fitting in" with all the guys driving heavy equipment? I have visions of Monty Python Lumberjack song, with guys wearing plaid on top and Victoria's Secret below. Send pics to confirm. Catsumi wrote: Gosh OT, you live such an exciting behind-the-scenes life, or are you just "fitting in" with all the guys driving heavy equipment? Hey...don't knock it before you try it. Don't tell the guys that I work with...that would get me a epic beating if they found out. Just wait until he brings out the chains for extra traction. Oldtrucker, dearie, just wanted to wish you a wonderful, happy, healthy 2019 filled with lots of LIKES received and given. And the same to you Catsumi. You were my first...and so far all the others just don't feel the same. Maybe I'm finally ready for you to take the dominant role now, and maybe one day you can show me the kinkier side of clicking. I know of the vanilla way now, and I know it wont be enough, and one day maybe I'll be ready to want to explore other ways. Doing that would require total trust between us though and I'm not sure you will be able to do that as I may still want to continue to try other inboxes. Skunkdom requires fidelity OT. Other inboxes reek of swamps and such. Read the "danger" signs before treading into unknown territories. I don't know...I've tried a few others over the last month and no one has any jealousy or attachment issues yet. Makes me feel kinda dirty. Yes, obviously you are being used and abused. The signs are clear and undebateable. Mend your pride. Stand tall. The Skunk is jealously observing.